As Preet Bharara approaches his sixth anniversary as the powerful United States Attorney for the Southern District of New York, with a track record of successful, attention-grabbing prosecutions that have made him the envy of his peers, it’s hard not to think that he is looking and sounding more and more like a candidate for higher office. You may not have noticed, but the Indian-born, Harvard-educated Bharara, now 46, has been making the rounds. Beyond the usual spate of public appearances at New York–area law schools and convocations of lawyers, he has been a regular commencement speaker and has even begun to appear on the celebrity circuit. Last fall, the writer Bryan Burrough interviewed him at the inaugural Vanity Fair New Establishment Summit in San Francisco. “It’s great to be here with all these cool people,” he told Burrough. Then, in February, a tuxedo-clad Bharara made an appearance at the Vanity Fair Oscar party in Los Angeles. “The ‘Enforcer of Wall Street’ and wife Dalya mingled with Hollywood royalty,” crooned Page Six, the New York Post’s popular gossip feature. The recent accolades are not undeserved. Bharara’s performance in office has indeed been impressive, and he is fresh off the high-profile surrender (and subsequent resignation) of Sheldon Silver, the supremely powerful speaker of the New York State Assembly, on charges of political corruption. Bharara’s ongoing investigation of bad behavior in Albany has sent shudders through the state capital, as politicians of every stripe wonder just how far up and down the food chain it will go. In this, he has been fearless. 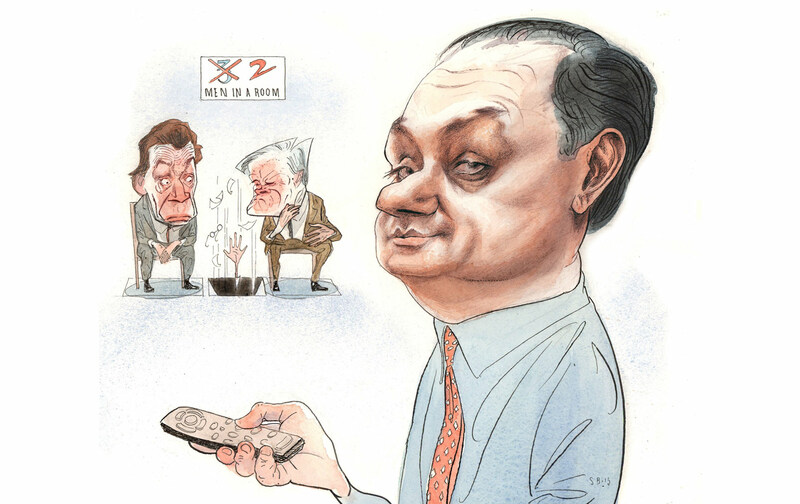 But beyond Bharara’s high-mindedness and toughness lies a prosecutor at a crossroads: Not only is Bharara, like Obama, probably reaching the end of his time in office (a new president generally likes to have his or her own appointee in such an important seat), but he is also, for the first time, beset by a spate of recent judicial challenges, rulings, and setbacks that have many questioning whether he has veered into overly aggressive behavior. These include an appeals-court reversal of two major insider-trading convictions—a ruling that has tarnished his extraordinary record of prosecuting insider trading and now threatens many of the other convictions as well—and a lawsuit connected to those reversals, which alleges that Bharara and his fellow prosecutors obtained a search warrant under false pretenses that led to the dissolution of a hedge fund because of the negative publicity that inevitably resulted. Both cases raise the specter of whether a powerful prosecutor has overstepped his bounds. On the surface, anyway, Bharara seems to be taking these nettlesome challenges in stride. And while Time magazine put him on its cover with the banner This Man Is Busting Wall St. more than three years ago, it is only lately that Bharara’s barnstorming is starting to have the look and feel of quasi–campaign rallies. On March 6, for instance, students, professors, administrators, and the merely curious jammed into an overflowing auditorium at Fordham Law School, near Lincoln Center, to hear Bharara discuss his latest campaign to root out corruption in Albany just weeks after a grand jury indicted Silver, following an investigation initiated by Bharara’s office. Bharara has been trying to end the practice of what he and others have rightly chastised as “three men in a room,” the system in which the governor and the two leaders of the State Legislature make decisions on their own, supplanting democracy in the process. With that introduction, as the CNBC cameras rolled, the print journalists scribbled away, and the audience hung on his every word, Bharara displayed his usual mix of firmness, self-deprecation, and canny references (including Archimedes and John Rawls), a style that makes him an inevitable topic of conversation when the subject turns to where to find America’s future leaders. At Fordham, Bharara also displayed a degree of humility unusual for someone in such a powerful position. As he often does, he thanked his colleagues in the audience, including his deputy, Richard Zabel, and the other members of the Public Corruption Unit. “Those are the heroes who are working hard night and day to fight against this problem of public corruption…not me,” he said. “They’re the ones that do the work.” And then there was his sense of humor, which is often on display. His wit is quick, like that of the president who appointed him. Bharara explained how he doesn’t have his framed law diplomas from Harvard and Columbia on his office walls, but he does have the honorary degree that he received from Fordham in 2013, when he delivered the school’s commencement address. It’s “a reminder to myself of the best and greatest undeserving accolade that I’ve ever gotten,” he added. It was the kind of jaw-dropping, unequivocal performance that New Yorkers had seen Bharara deliver repeatedly over the years, whether it was in compiling an 85-0 record (before recent setbacks) in his prosecution of insider trading on Wall Street, or in the well-publicized convictions of would-be Times Square bomber Faisal Shahzad and veteran arms trafficker Viktor Bout. Bharara disagreed. In his own court filing, he wrote that at all times he had “hewed closely” to the original complaint, repeatedly emphasized that the “charges were allegations,” and “explicitly stated” that Silver was “presumed innocent unless and until proven guilty.” In his public comments, Bharara continued, he did “not in any way opine on the defendant’s guilt, and complied with all relevant rules and regulations in a manner consistent with his duties as the chief federal law enforcement officer” in the Southern District of New York. In a recent interview in his modest office in Lower Manhattan, conveniently located behind New York City’s police headquarters and near the state and federal courthouses, Bharara refused to accept that his comments about Silver were inappropriate. “I have an absolute, not just right, but obligation to conduct myself in this job not only for the purpose of holding people accountable, but also for deterrence purposes and for prevention purposes,” he said. “I’m not going to stop talking about public corruption.” He said that not speaking out would be ludicrous and contrary to his mandate. But the day after our conversation, Valerie Caproni, the judge in the Silver case, rebuked him. “In particular,” Caproni wrote, she was “troubled” by Bharara’s remarks “that appeared to bundle together unproven allegations regarding [Silver] with broader commentary on corruption and a lack of transparency in certain aspects of New York State politics. In this regard, the Court finds that it would not be unreasonable for members of the media or the public to interpret some of the U.S. Attorney’s statements—for example, ‘[p]oliticians are supposed to be on the people’s payroll, not on secret retainer to wealthy special interests they do favors for’—as a commentary on the character or guilt” of Silver. Caproni also criticized Bharara for giving his speech at New York Law School the day after Silver’s arrest, opining that he should have put off Silver’s arrest until after the speech and instead discussed already convicted politicians. But Caproni did not throw out Silver’s indictment or poll the grand jurors, as Cohen requested, and her ruling will likely have minimal effect on the overall case. Still, for Bharara, it was a rare—and public—setback. There have been other recent set backs, too. For years, Bharara has been criticized for not pursuing criminal cases against the Wall Street executives who brought us the recent financial crisis. And for years he’s maintained that it’s not for lack of trying, or because he doesn’t want to hold people accountable; instead, Bharara argues, there’s simply no case to be made, either because there’s not enough evidence or because what many people perceive as wrongdoing is not technically illegal. His message has always been that people have to trust him on this, since he’s dug through the available evidence and they have not. But the lack of criminal and civil prosecutions against individual executives—as opposed to the companies they work for—has become more acute since Attorney General Eric Holder announced on February 17 that the nation’s federal prosecutors should bring cases related to the financial crisis within 90 days. This argument—that the federal government would prosecute if it could, but it just doesn’t have the law on its side—infuriates Dennis Kelleher, the president and CEO of Better Markets Inc., a nonpartisan, independent Wall Street watchdog. He says the various multibillion-dollar settlements between Wall Street banks and, among others, the Justice Department are little more than an elaborate cover-up of what really happened. In arguing that Newman and Chiasson did receive such a benefit, Bharara and his team were hoping the appeals court would uphold the convictions and allow for a more generous interpretation of what constitutes insider trading. Instead, Bharara is left with the uncomfortable choice of hoping that the US solicitor general will appeal the Second Circuit’s ruling to the Supreme Court (unlikely), or that Congress will come up with a clearer definition of insider trading (equally unlikely). In fact, there is currently no law that sets out a clear definition of insider trading; instead, there’s a somewhat oblique Securities and Exchange Commission rule that courts have interpreted over the years based on individual cases—many of which have been successfully brought by Bharara’s office. The Second Circuit’s decision threatens to upend a number of Bharara’s previous insider-trading convictions. To put it mildly, Bharara is not thrilled about this possibility. He worries that the Second Circuit has created a blueprint for people to engage in insider trading by capitalizing on information that others don’t have access to and then simply claiming that they didn’t expect any substantive financial benefit in return. He offers an example of how, under the Second Circuit’s thinking, a father with privileged information could legally bestow a gift worth tens of millions of dollars upon his children by sharing that information with them, and then arguing with a straight face that he didn’t get any financial remuneration. But while there are a few bills before Congress that would define insider trading with more precision (though they’re unlikely to become law for the simple reason of ongoing congressional dysfunction), Bharara is not outspoken about ways to rectify the situation. Instead, he sticks to the bland assertion that prosecutors should be given the necessary legal tools, either by Congress or the judiciary, to punish those people who have violated the law. In short, Ganek and his attorneys argue that Bharara had no probable cause to believe that Ganek had done anything wrong, and neither the Justice Department nor the SEC had charged him with a crime. Nevertheless, they argue, the FBI and Bharara’s team “fabricated” evidence against him in order to obtain the search warrant, in particular twisting a story from a Level Global employee that Ganek had been involved in insider trading when, in fact, the employee said the exact opposite. They argue that Ganek’s civil rights have been violated: “Because of the raid,” his lawyers wrote, “Mr. Ganek faced the foreseeable consequence that his investors—themselves highly sophisticated financial professionals—would withdraw their investments from his fund, which would cause it to fold.” Despite Ganek’s efforts to assure his investors that he had not engaged in insider trading, and despite a meeting between his lawyer—an alumnus of Bharara’s office—and the US Attorney in which the former asked Bharara to clarify publicly that Ganek had not engaged in wrongdoing (something Bharara declined to do), Level Global closed its doors in February 2011. Where does this leave Bharara and his unusual combination of power, humor, and grace? In the post-Obama era of national politics, wouldn’t he be the perfect next act? After all, his ambitions are sufficiently high that he occupied a coveted place on the short list to replace Holder as attorney general (instead, Obama chose Loretta Lynch, the US Attorney for the Eastern District of New York, in Brooklyn). Plenty of people think a natural match-up for New York governor would pit Bharara against Eric Schneiderman, the state attorney general, in either the primary or the general election. Bharara is quick to point out that a change in presidential administrations does not necessarily mean a change in US Attorneys. And it’s true that someone like Rod Rosenstein, the US Attorney for the District of Maryland, was appointed by President Bush and continues to serve under President Obama. Bharara reiterates that he can’t understand why people find it so hard to believe that he would just like to stay on as the US Attorney for the Southern District of New York. The subject of his future clearly makes him uncomfortable, and before long the conversation has drifted to his love of cultural references. A picture of Bharara and Bruce Springsteen, his fellow New Jerseyite, hangs on the wall behind him. We are suddenly talking about Yik Yak, the anonymous social-media app, and pig Latin, and Better Call Saul, the spin-off from Breaking Bad, and then we’re on to Breaking Bad itself. Bharara explains that his wife wouldn’t watch the show because she gets too tense, and that he only started making references to it in his speeches after he finished binge-watching the series.